If only they could agree on where to begin. What kind of national-security policy will the Trump administration pursue globally? On this issue, as on so many others, the incoming president has offered enough contradictory clues, tweets, and comments that the only definitive answer right now is: Who knows? And then, of course, there’s China. After all, in addition to his own belligerent comments on that country, his prospective secretary of state, Rex Tillerson, and his press secretary, Sean Spicer, have both recently suggested that the United States should prevent China from accessing artificial islands that country has created and fortified in the South China Sea—which would be an obvious American act of war. In sum, don’t take the promise of non-intervention too seriously from a man intent, above all else, on pouring money into the further “rebuilding” of a “depleted” US military. Just who might be the focus of future Trumpian interventions is, at best, foggy, since his vision of The Enemy—ISIS aside—remains an ever-moving target. Suppose, though, we judge the new president not by his own statements alone, but by the company he keeps—in this case, those he chooses to advise him on national security. Do that and a strange picture emerges. On one thing all of Trump’s major national-security appointees seem crystal clear. We are, each one of them insists, in nothing less than a world war in which non-intervention simply isn’t an option. And in that they are hardly kowtowing to the president. Each of them took such a position before anyone knew that there would be a Donald Trump administration. There’s only one small catch: None of them can quite agree on just whom we’re fighting in this 21st-century global war of ours. So let’s take a look at this crew, one by one, and see what their records might tell us about intervention, Trump-style. The most influential military voice should be that of retired Lieutenant General and National Security Adviser Michael Flynn (though his position is already evidently weakening). He will lead the National Security Council (NSC), which historian David Rothkopf calls the “brain” and “nerve center” of the White House. 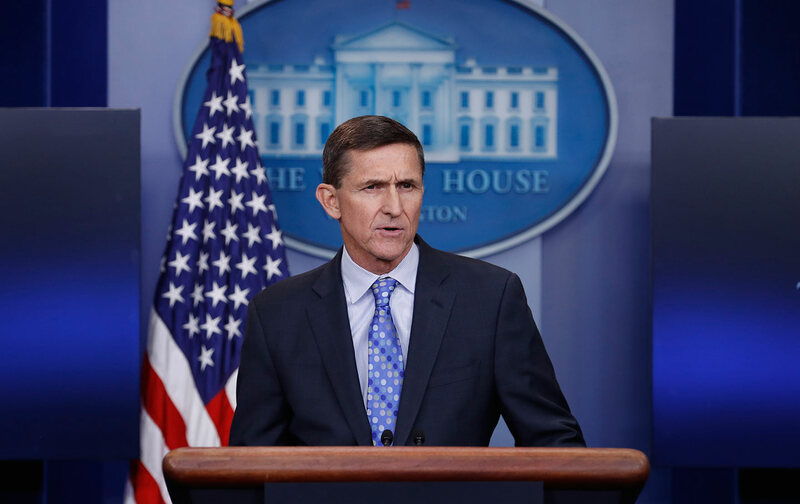 Flynn laid out his views in detail in the 2014 book he co-authored with neocon Michael Ledeen, TheField of Fight: How We Can Win the Global War Against Radical Islam and Its Allies (a volume that Trump, notorious for not reading books, “highly recommended”). To call Flynn’s views frightening would be an understatement. How Shi’ite Iran can be the “linchpin” in what turns out to be a worldwide insurgency of the Sunni Islamic State (aka ISIS) is something of a mystery. Perhaps it’s not any single version of Islam that threatens us, but the religion in all its many forms, or so Flynn seems to have decided after he published his book. In this spirit, in February 2016 he infamously tweeted “Fear of Islam is RATIONAL” as an endorsement of a video that indicted and vilified that religion of 1.6 billion people. And to this day he evidently remains unsure whether “radical Islam”—or maybe even Islam as a whole—is a religion or a political ideology that we must fight to the death. Take his top assistant at the NSC, K.T. McFarland. For her, the enemy is neither a nation nor a political unit, but a vaguely defined “apocalyptic death cult…the most virulent and lethal in history” called “radical Islam.” She adds, “If we do not destroy the scourge of radical Islam, it will ultimately destroy Western civilization…and the values we hold dear.” For her, it’s an old story: civilization against the savages. There’s no way to know whether McFarland will have real influence on decision-making in the Oval Office, but her view of the enemy has been voiced in much the same language by someone who already does have such influence, white nationalist Steve Bannon, whom the president has just given a seat on the National Security Council. (He reportedly even had a major hand in writing the new president’s Inaugural Address.) Trump’s senior counselor and key adviser on long-term foreign policy strategy offered rare insight into his national-insecurity views in a talk he gave at, of all places, the Vatican. Still another view comes from retired general and Secretary of Homeland Security James Kelly. He, too, is sure that “our country today is in a life-and-death struggle against an evil enemy” that exists “around the globe.” But for him that evil enemy is, above all, the drug cartels and the undocumented immigrants crossing the US-Mexican border. They pose the true “existential” threat to the United States. Everyone on Trump’s national-insecurity team seems to agree on one thing: The United States is in a global war to the death, which we could lose, bringing some quite literal version of apocalyptic ruin down on our nation. Yet there is no consensus on whom or what exactly we are fighting. Flynn, presumably the key voice on the national-insecurity team, offers a vast and shifting array of enemies milling around pugnaciously on Trumpworld’s field of fright. The others each highlight and emphasize one or more groups, movements, or nations in that utterly confused crew of potential adversaries. This could, of course, lead to bruising disagreements and a struggle for control over the president’s foreign and military policies. It’s more likely, though, that Trump and his team don’t see these differences as crucial, as long as they all agree that the threat of destruction really is at our doorstep, whoever the designated deliverer of our apocalyptic fate may be. Starting out with such a terrifying assumption about how our present world works as their unquestioned premise, they then can play fill-in-the-blank, naming a new enemy as often as they wish. One question: Why is such an apocalyptic approach—even when, as at present, so ludicrously confused and unsupported by basic facts, not to say confusing to its own proponents—convincing for so many Americans? Trump and his national-insecurity team are blessed with an added benefit in this process: the coming of all-news, all-the-time media, which has a tendency to inflate even the relatively modest (if bloody) acts of “lone wolf” terrorists until they seem to engulf our lives, 24/7, threatening everything we hold dear. Images of terror that might once have been glimpsed for a few minutes on the nightly news are now featured, as with the San Bernardino or the Pulse nightclub killings, for days, even weeks, at a time. In part, too, such collective apocalyptic anxiety gives Americans a perverse common bond in a world in which—as the recent presidential campaign showed—it’s increasingly hard to find a common denominator that defines American identity for all of us. The closest we can come is a shared determination to defend our nation against those who would destroy it. In 2017, if we didn’t have such enemies, would we have any shared idea of what it means to be an American? Since we’ve been sharing that sense of identity for three-quarters of a century now, it’s become, for most of us, a matter of unquestioned habit, offering the peculiar comfort that familiarity typically brings.